Sr. Rastislava Ralbovsky is a part of the Congregation of the Sisters of Mercy of St. Cross of the Croatian Province in Djakovo. She is the one who initiated the pilgrimages for persons with disabilities to Medjugorje, and that pilgrimage is going to be held for the fifth time this year in June. 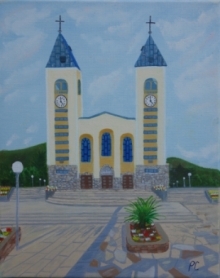 She gave a testimony last August at the Youth Festival and spoke about her connection to Medjugorje as she has been coming here since 1981: „Most of the people who are coming here have some special intentions and needs. In that sense, I had some young people who were coming with me and many of them had various crisis and difficulties, either because of their families, addictions or psychological problems. That group was created with the purpose of providing support to those young people. Gradually, the group developed and today is a part of the programme that we carry out with special love and care. Thanks to late Fr. Slavko, in 1997 we began to bring people with disabilities on a pilgrimage to Medjugorje. We started coming here every year since that time. At our delight, those pilgrimages gained the international dimension recently and we have huge support from the parish of Medjugorje with free accommodation and food, as well as the beautiful programme throughout that period. Here, at our Mother’s embrace, we who are healthy are learning how to discover value and perfection in special needs persons, and at the same time we are receiving lots of unconditional love and joy from them. It is parishioners of Medjugorje who always say to us at the end: 'We received far more than we gave and offered'. I also accompanied groups from the other programmes to Medjugorje. Everything developed slowly, without advertising. What does the spiritual aid mean? We normally identify that with person who is relieved of his cross, however sometimes that is not possible. For instance, when persons who are handicapped or mentally ill and have some sort of chronic condition, we are facing the situation that can hardly be resolved. God can always perform a miracle. Yet, mostly those are conditions that remain for the whole life with all of their consequences. The cross will always remain a mystery. I was only trying to do what I learned from Our Lady. It was to be there for those persons, to be there for them even when you do not know what to do for them. We were trying to create a corner for them where they would feel loved and accepted, where they would feel that they have their own dignity. God loves those persons and for Him there is no difference between them and us who are healthy. What is really important for me is to create an atmosphere of being loved, to make them appreciated and to let them know that they have their own dignity regardless of their illness, psychiatric condition or mental illness. We need to do so much for them. It was there that Gospa was teaching me how it was necessary to bring them the spiritual dimension that Jesus left to His Church. Two major projects developed from that: therapeutic workshop of St. Joseph that gathers mentally ill persons and their parents and friends, and we were also involved into the international movement 'Faith and Light'. There was also one group of friendships that was made with young people with life troubles of various kinds, mostly of psychological nature. Spontaneously, one good combination was made. Those young people are coming as volunteers, as friends, to help those persons with disabilities. It is very good to approach and to be close to persons who are suffering “, said Sr. Rastislava.